The asthma prescription market is slowing as the leading drugs lose patent protection. But leading market researchers BCC and GBI Research each predict moderate growth until at least 2017, thanks to new market entrants and a disease prevalence that continues to rise globally. BCC figures indicate the market for asthma medications was $15.3 billion in 2012 and is projected to grow at 5.7% to $20.2 billion by 2017, says Peggy S. Lehr, market research analyst. GBI, looking at the top eight developed nations, pegs its predictions at about $1 billion more than BCC, both for 2012 markets and for the 2019 market. Nearly 11% of the U.S. population has been diagnosed with asthma according to Lehr. “Disease prevalence is projected to increase based on a globally aging population; continued exposure to environmental risk factors such as smoking, air pollution, continued urbanization; obesity; childhood risk factors such as low birth weight and chronic bronchial infections; better recognition of symptoms,” she explains. “Market constraints include the complexity of manufacturing asthma products, efficacy from clinical trials, lack of access in some regions of the world. “Asthma is a highly heterogeneous disease, especially in the severe patient segments,” adds Bing Yao, Ph.D., head of respiratory, inflammation, and autoimmunity at MedImmune. Therefore, biopharmaceutical developers are beginning to focus on personalized therapeutics rather than broad agents. “The key is to understand the molecular phenotype of the disease,” Dr. Yao points out. According to Tunde Otulana, M.D., senior vp, clinical development and medical affairs, Boehringer Ingelheim (BI), there is only one approved monoclonal antibody (mAb) therapy in the United States for the treatment of asthma. This mAb, omalizumab, is indicated for a subset of severe asthmatics with elevated IgE levels. “There are a few other mAbs in development to block different cytokines in asthma. Whether any of these compounds will successfully be registered and what their role in the management of asthma might be is not well understood at this time,” says Dr. Otulana. “Monoclonal antibodies (in particular) are set to alter the asthma therapeutic landscape, providing alternative therapy for patients who remain symptomatic despite standard treatment,” notes GBI’s Mushtaq. Boehringer Ingelheim’s Respimat® device delivers therapeutics in a soft mist, similar to a fine nebulizer, so patients needn’t inhale to activate the device. That improvement is tightly linked to personalized medicine, according to Dr. Yao. “We are taking a personalized healthcare approach, targeting the underlying causes of disease to evolve the treatment paradigm,” Dr. Yao says, adding that MedImmune has several drugs in the pipeline. One of these is benralizumab, a mAb that binds to the alpha chain of the interleukin-5 receptor. The mAb, which depletes eosinophils, entered Phase III clinical trials this past autumn for patients with eosinophilic asthma—roughly 40–60% of all asthmatics. “We have a diagnostic incorporated into development for patient selection,” says Dr. Yao. Tralokinumab (CAT-354) is a human mAb that binds directly to interleukin-13 (IL-13), thereby blocking multiple effects of this pleiotropic cytokine in the lung such as inflammation and airway hyperresponsiveness. A Phase IIb clinical study has recently been completed in severe, uncontrolled asthma and will be evaluated for advancement into Phase III in 2014. MedImmune is developing brodalumab with Amgen. The mAb targets the IL-17 receptor and is in a Phase IIb clinical study. It has potential for a different patient segment such as neutrophilic asthma. A fourth molecule in development, also in collaboration with Amgen, is an upstream cytokine dubbed MedI9929/AMG157 that blocks the interaction of thymic stromal lymphopoietin (TSLP) with the TSLP receptor. It has potential to target a broader population than MedImmune’s other asthma pipeline compounds. “Interest in developing mAbs for the treatment of asthma is strong within the biotech and biopharmaceutical sectors,” Mushtaq underscores. And anti-cytokines are being developed for severe, corticosteroid-refractory asthma patients, fulfilling an unmet need. Their launch will be an early move toward personalized asthma therapeutics. Sanofi and Regeneron are developing dupilumab for eosinophilia asthma. Dupliumab is an antibody to the IL-4 and IL-13 receptors. A report in the New England Journal of Medicine last June indicates that dupilumab reduced exacerbation by 87% when compared to placebo, with significant improvements in lung function and the reduction of biomarkers associated with inflammation. That trial deemed it particularly effective for patients not benefiting from inhaled glucocorticosteroids or long-acting beta-agonist therapies. Recruitment began in November for dosing studies, with primary outcomes expected in late 2014. According to Mushtaq, the mAb lebrikizumab, owned by Roche and being developed by Genentech, “is among the most notable drugs in late-stage development.” The drug, which targets IL-13, is in Phase III trials for use with standard-of-care or secondary treatments, and in Phase II for idiopathic pulmonary fibrosis. Registration filing is expected sometime after 2016.
Genentech is also developing the mAb quilizumab (MEMP1972A), which is in Phase II clinical trials for the treatment of allergic asthma, adds Mushtaq. It targets the IgE pathway to eliminate the B cells that would develop into plasma cells and produce IgE. Primary completion is expected May 2014. GBI also considers reslizumab by Teva Pharmaceuticals and mepolizumab by GSK as promising. Teva expects to have completed a Phase III dose determination study for patients with eosinophilic asthma soon, and is recruiting for a Phase I study “to assess the absolute bioavailability of reslizumab following administration of a single subcutaneous dose to healthy non-Japanese subjects,” according to ClinicalTrials.gov data. GSK has a Phase III trial underway, comparing the efficacy of mepolizumab in reducing oral corticosteroid use in patients with severe refractory asthma. A Phase III dosing study also is in progress. Primary completion for both studies is expected Spring 2014. GBI also considers Rottapharm Madaus’ andolast, an airway specific anti-inflammatory agent, promising as a calcium-activated potassium channel modulator. It is in Phase III trials. 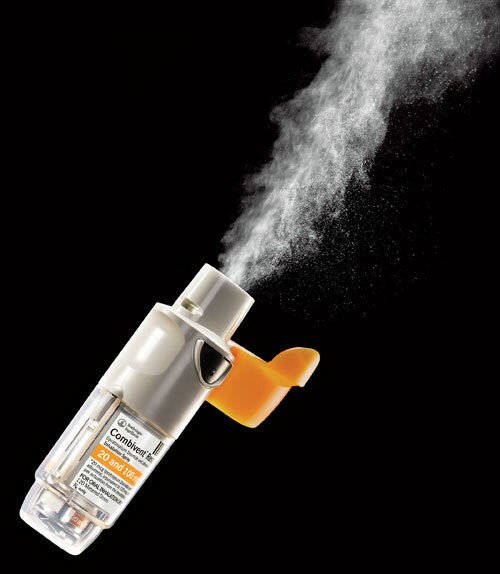 The company also has a leukotriene D4 receptor angonist, CR3465, in Phase I trials for bronchial asthma. The development of these drugs is following a fairly traditional approach. BI in November submitted a European application to extend the indications for Spiriva® (tiotropium) to treat asthma in adults. A U.S. application is planned for 2014. Phase III data presented at the European Respiratory Society congress in September indicates that, as an adjunct to inhaled corticosteroid therapy, tiotropium significantly improves asthma control and delays exacerbation of the disease. As Burcu Eryilmaz, vp, respiratory marketing, BI, says, “Spiriva is available in the HandiHaler® device, but will become available in another device in 2015 for chronic obstructive pulmonary disease and not asthma.” The new device, Respimat®, delivers therapeutics in a soft mist. BI also is studying nintedanib as a treatment for idiopathic pulmonary fibrosis, a devastating orphan disease. “It’s in Phase III trials, now,” Eryilmaz continues.